Lying at a distance of 30,000 light years from the centre of the Milky Way galaxy the Sun takes over 200 million years to complete one orbit. It is the central body of the Solar System, containing 99.8% of its mass, and is the nearest star to the earth lying at an average distance of 149,600,000 km. Without its energy life on earth would not be possible. With a diameter of 1,392,000 km the Sun is classed as a yellow dwarf star that is 4.6 billion years old and is about half way through its life cycle. It will eventually expand into a red giant star and finally collapse to a white dwarf. The effective surface temperature of the Sun is around 5,800 degrees C while the centre of its core experiences temperatures of 15,000,000 degrees C. This core is extremely dense and although it contains only 1.5% of the volume of the Sun it contains over half of the Sun's mass. 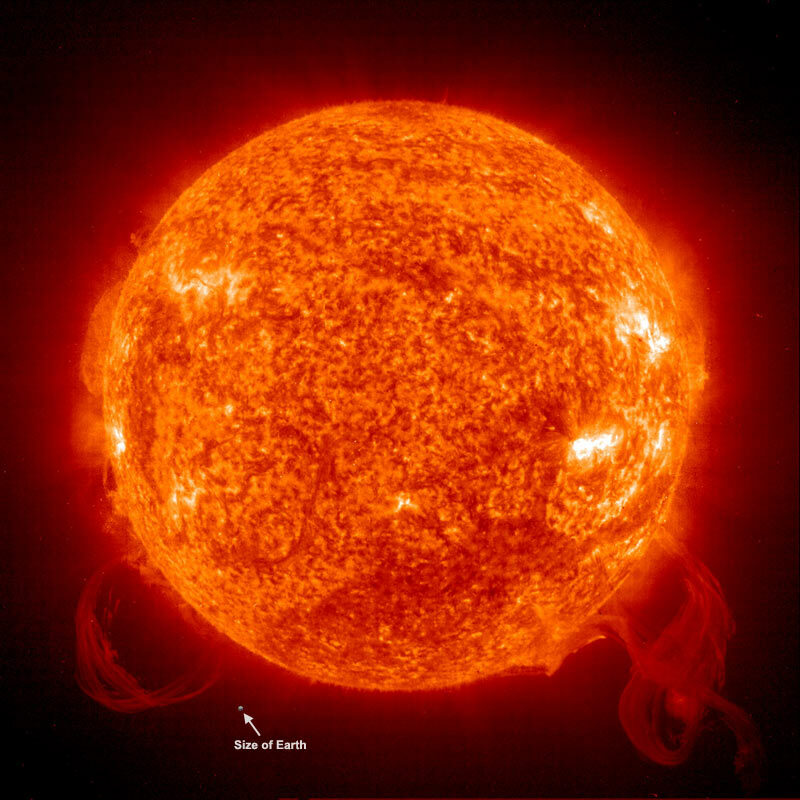 The Sun is composed mainly of hydrogen (70%) and helium (28%) with about 2% of heavier elements. It generates its energy by the nuclear fusion process and is losing mass at a rate of 4 million tonnes every second. It can take as long as 20 million years for the energy created in the core to reach the Sun's surface. This energy is given off as heat and light and a low density stream of charged particles known as the solar wind which blows throughout the solar system at speeds of 450km/second. Because the Sun is virtually a ball of gas it rotates at different speeds at different latitudes. At the equator the rotational period is around 25.4 days and near the poles the period is closer to 36 days. It has a period of energy fluctuations from high to low and back to high again. This is known as the sunspot cycle and is roughly 11 years long. The Sun's magnetic field reverses after each sunspot cycle and so takes 22 years to get back to where it was before. At the moment the solar cycle is at one of its low points and there are only a few small sunspots to be seen. Warning! Under NO circumstances try to observe the Sun without the proper solar filters. Since the reclassification of Pluto from the "Planet" to the "Dwarf Planet" category, Mercury has now become the smallest of the main Solar System planets. The closest planet to the Sun, Mercury is a rocky planet with a diameter of 4,878 km orbiting the Sun in 87.97 days at an average speed of 47.89 km/second. Its distance from the Sun varies from 46,375,318 km to 70,310,966 km and has the largest known difference in daytime-nighttime temperatures in the Solar System. The sunlight striking Mercury when it is at its closest point to the Sun is 2.3 times as intense as it is at the most distant point in its orbit. Because it has almost no permanent atmosphere to shield it from the sunlight during the day and hold the heat during the night its daytime temperature reaches 447 degrees C and plummets to minus 153 degrees C at night. Strangely Mercury's day is longer than its year. The solar rotation period, noontime to noontime or one Mercurian day is 175.84 Earth days which equals two Mercurian years. Photography of half of Mercury's surface by Mariner 10 in 1974 and 1975 showed it to resemble the Moon in being heavily cratered with intervening areas of lava flooded plains with the largest impact feature detected being 1,300 km in diameter. Whereas the features on the Moon are named after scientists and astronomers, the features on Mercury are named after world cultural figures such as architects, composers, writers and artists. As Mercury orbits so close to the Sun it can only be observed from the Earth in either morning or evening twilight and at times can be quite elusive as at its best only ventures 28 degrees in angular distance from the Sun. 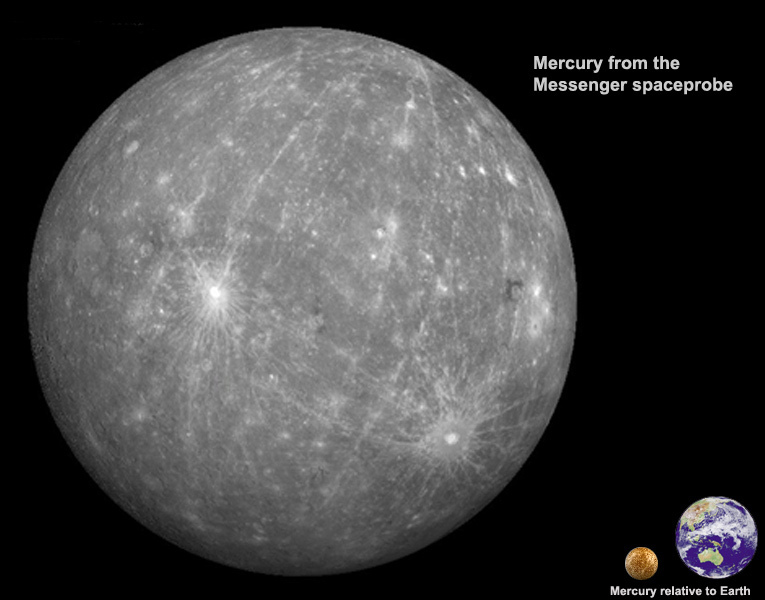 Transits of Mercury across the Sun's disc as seen from the Earth are reasonably common but can only occur in the months of May or November with the intervals at which they occur being 3, 7, 10 or 13 years. The next will occur on May 9th 2016. The second planet from the Sun, Venus is the brightest object in the night sky apart from the Moon. One of the reasons it is so bright is the very high reflectivity of its upper atmosphere which reflects 76 percent of the light it receives from the Sun. It is also the planet which comes the closest to the Earth, at times being closer than 42,000,000 km. Depending on its position in its orbit around the sun it can be seen as either the "Morning Star" or the "Evening Star" sometimes rising before the Sun in the morning sky and sometimes setting after the Sun in the evening sky. Ancient astronomers thought that the "Morning Star" and the "Evening Star" were two different objects and named them Phosphorus and Hesperus. It was Pythagoras, a Greek mathematician and philosopher, who realized that they were in fact the same object. With an equatorial diameter of 12,104 km it was envisaged that Venus was the Earth's sister planet and was very similar to the Earth in its makeup. This could not be further from the truth as space probes have revealed extremely hostile atmospheric and surface conditions. 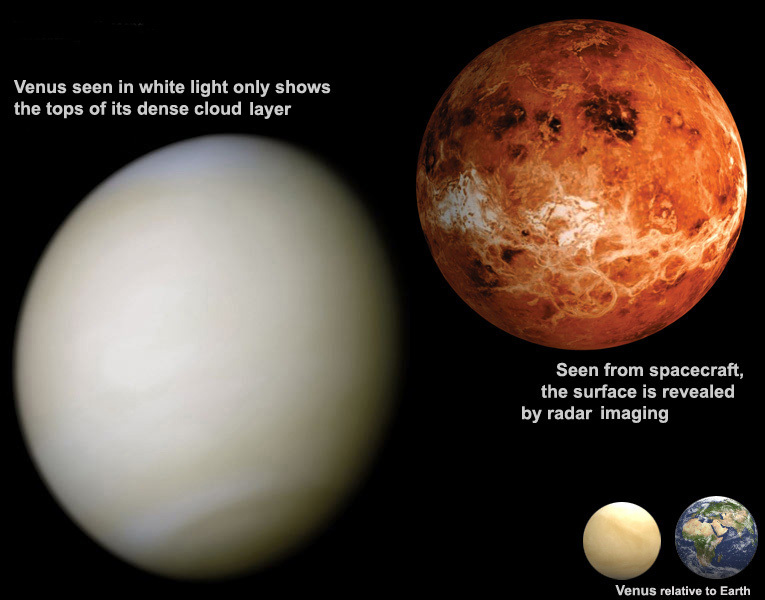 The atmospheric pressure on Venus is 91 times greater than the atmospheric pressure here on Earth with the atmosphere saturated with clouds of sulfuric acid aerosols. Venus orbits the Sun at a speed of 35 km/second and takes 224.7 days to complete the journey. It is the only planet apart from Uranus which rotates backward on its axis and so the Sun rises in the west and sets in the east with one Venetian day, noon to noon, being equal to 116.67 Earth days long. The orbit of Venus is the most circular of all the planets and because the tilt of its axis of rotation is less than 3 degrees from the line of its orbit around the Sun it has no weather patterns on its surface. Its surface temperature remains at a constant 457 degrees C, plus or minus 5 degrees C, all year round even through the long Venetian night. Venus is the hottest of all the planets and the high constant temperature is due mainly to the huge amounts of carbon dioxide in its atmosphere. This thick carbon dioxide atmosphere allows small amounts of visible light to penetrate which is reflected off the surface as infrared radiation and trapped by the atmosphere. Because of this constant surface temperature and because of its slow rotation the winds blowing across the surface of the planet reach no more than 10 km/hour but at altitudes higher than 50 km there have been winds up to 360 km/ hour detected. Because Venus orbits the Sun inside the orbit of the Earth it can never be observed overhead in the middle of the night as it only reaches an angular distance of 48 degrees from the Sun as seen from the Earth. Although telescopesdo not reveal any surface features on the planet it is interesting to observe its changing phases from gibbous to crescent as the angle at which the Sun's light strikes the planet changes from our earthly perspective. On rare occasions Venus can be seen to cross the Sun's disc. These transits can only occur in the months of June or December with the last one occurring on June 8th 2004 and the next one due on June 6th 2012. Make the most of the 2012 transit as the next one after that will not occur until December 11th 2117. 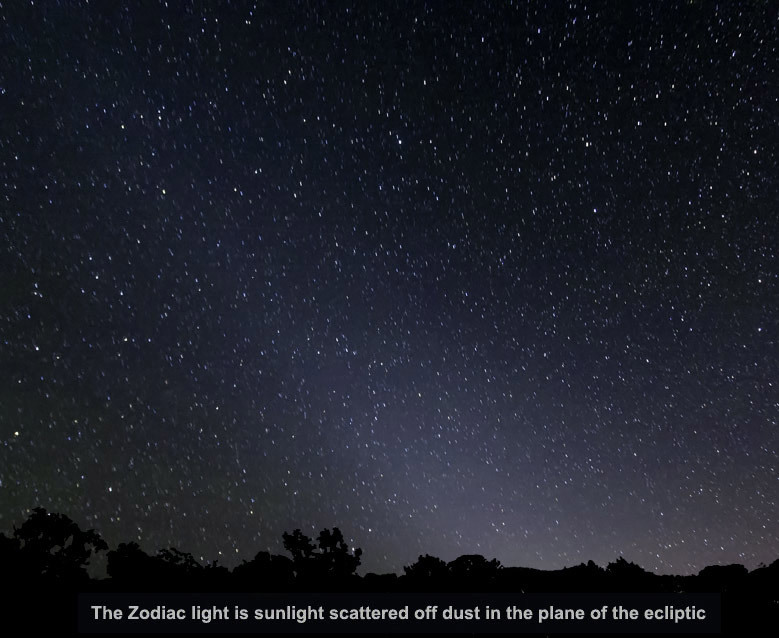 The Zodiacal light is often confused with the brightness of the sky due to a lingering twilight as it occurs in roughly the same area of the sky. It is produced by sunlight reflecting off cosmic dust particles in orbit around the Sun. Most of the particles that can be seen have sizes in the range from 10-100 micrometers and are produced by decaying comets and colliding asteroids and are spiraling slowly in towards the solar surface. The light is seen as a cone of light about 20 degrees to 30 degrees wide at the horizon and on a clear night can extend halfway to the zenith. It is most noticeable when the Sun is more than 18 degrees below the horizon and astronomical twilight has ended. The best months to observe the Zodiacal light from southern latitudes are from September into November in the evening sky and February and March in the morning sky. These are the months when the ecliptic, the imaginary line plotted in the sky by the Sun's path, is at its largest angle to the horizon. A clear moonless night away from light pollution is a must to observe this delicate phenomenon. Earth is our home. It is a small globe of rock 12,756 kilometers across with a bit of water splashing around. It orbits around the Sun every 365.25 days at an average distance of 149,597,870 kilometers. It rotates every 23 hours and 56 minutes about a tilted axis of 23.45 degrees which allows seasonal variation. There is a thin atmosphere, about 100 kilometers thick, of mainly Nitrogen, Oxygen and Carbon Dioxide. It is the only place known to support life as we know it, though some other candidates await confirmation in the solar system and some recently discovered Earth-like bodies around other stars. The only natural satellite of the Earth and the fifth largest natural satellite in the Solar System, the Moon is visible by virtue of reflected sunlight. It has a diameter of 3,476 km and lies at an average distance of 384,400 km from the Earth taking 27.322 days to complete one orbit at a speed of just over 1 km/second. This is the same amount of time it takes to spin once on its own axis and so always shows the same face to the Earth. 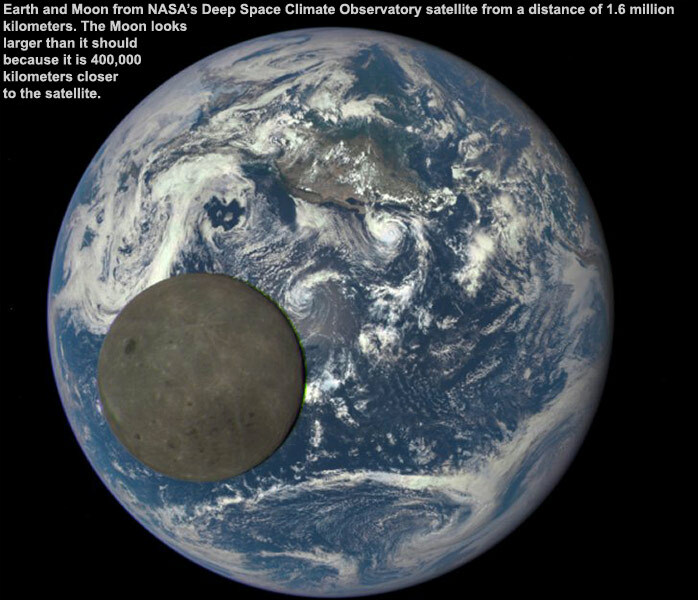 Because the Moon wobbles slightly as it orbits we get to see about 59% of its surface. Since the Earth is moving in its orbit around the Sun as the Moon orbits the Earth it takes a little longer to go through its cycle of phases as The only natural satellite of the Earth and the fifth largest natural satellite in the Solar System, the Moon is visible by virtue of reflected sunlight. It has a diameter of 3,476 km and lies at an average distance of 384,400 km from the Earth taking 27.322 days to complete one orbit at a speed of just over 1 km/second. This is the same amount of time it takes to spin once on its own axis and so always shows the same face to the Earth. Because the Moon wobbles slightly as it orbits we get to see about 59% of its surface. Since the Earth is moving in its orbit around the Sun as the Moon orbits the Earth it takes a little longer to go through its cycle of phases as seen from the Earth. 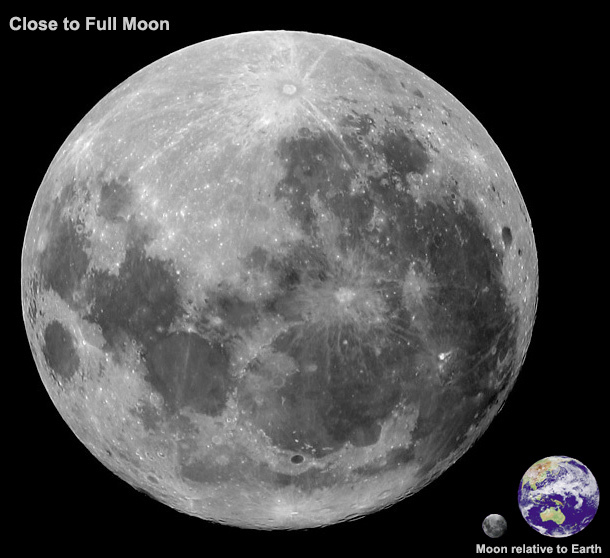 From one full Moon to the next a period of 29.5 days elapses. Each spot on the Moon is subjected to two weeks of daylight during which surface temperatures reach 100 degrees C and two weeks of darkness when the temperature plummets to -170 degrees. The daily rotation of the Earth and the slower eastward revolution of the moon in its orbit usually produce two high tides and two low tides in the Earth's oceans every 24 hours 50 minutes. Traces of argon, helium, oxygen, methane, nitrogen, carbon monoxide and carbon dioxide have been detected in the Moon's atmosphere but this atmosphere is so thin as to be almost negligible. These gasses are, in part, the result of micrometeorites striking the surface of the Moon but because of the Moon's low gravity, about 17% that of the Earth's; they are very quickly lost into space. It is because of this lack of atmosphere that the face of the Moon hasn't changed significantly for millions of years. The temperature at the center of the Moon is around 1500 degrees C and its core, consisting mainly of metallic iron alloyed with a small amount of sulfur and nickel, is around 1200 km in diameter. Directly above the core lies the mantle, 1100 km thick and composed mainly of iron, magnesium and silicates and this is covered by the crust with a depth of 60 km which consists primarily of calcium, aluminium and silicates. The dark lowland plains are known as Maria, Latin for seas, because the first observers imagined them to be oceans of water. The name persists today even though we know that the Moon is waterless. The lunar highlands are named after mountain ranges on the Earth and so we have the lunar Alps and the Apennines. Because of the lack of atmosphere on the Moon there can be no twilight and the line, known as the terminator, dividing the night and day sides of the moon has bright daylight on one side and pitch blackness on the other. At times when viewed through a telescope sunlit peaks can be seen protruding from the night side of the terminator. Most of the lunar craters are round, the few elongated ones being caused by impacting bodies that arrived at a sharper angle to the surface than 5 degrees. The origin of the Moon is still being debated with the Giant Impact Theory seeming to have taken favoritism. This proposes that a glancing high speed collision of a huge possibly Mars sized object with the primitive Earth, smashed what crust the Earth had and blasting it into space. The ejected material condensed to form a ring of orbiting debris and the Moon coalesced from this. It is our nearest celestial neighbor and so far the only other world upon which mankind has so far set foot. We tend to take the Moon for granted and most of us hardly give it a second glance. However when atmospheric conditions are right the moon can produce some interesting and rather stunning effects. 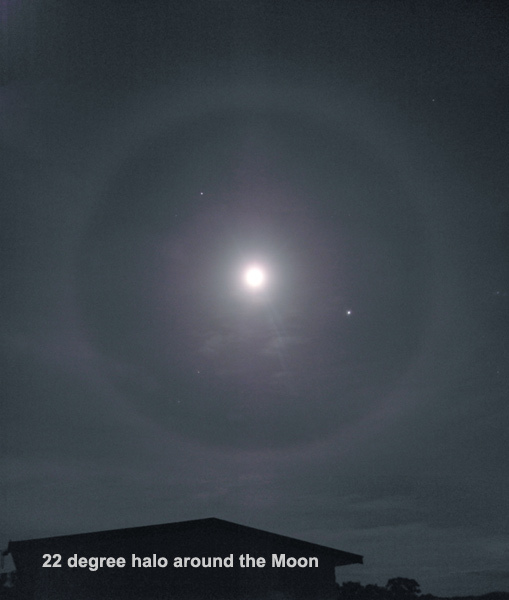 Perhaps the most common of these effects are the Moon halos, large rings which circle the moon on a hazy cold night and have a radius of either 22 degrees or 46 degrees. The most frequently seen seem to be the 22 degrees halos. They are more intense when the Moon is at its brightest, around full Moon but can be witnessed to a lesser degree at other bright phases of the Moon. For the rings to appear there needs to be a layer of thin cloud containing millions of tiny ice crystals covering much of the sky high in the upper atmosphere. Each of these ice crystals behaves like a small lens and because most of these crystals have the same elongated hexagonal shape the moonlight entering one face of the crystal and exiting its opposing face is bent at an angle of 22 degrees. The larger 46 degrees ring which is far less typical may be caused by the light exiting at different angles from the crystals. A much smaller ring, usually about 3 degrees in radius can often be seen around the Moon and this is known as a Lunar Corona. They are also caused by high thin cloud but the moonlight is being refracted by water droplets in the clouds and not by ice crystals. On rare occasions Moon Halos and Lunar Coronae can be seen together. The Lunar Coronae have been known to swell or shrink slightly depending on the size of the water droplets that are present in the passing clouds. There can also be colours present on the coronae but these colours are always very subtle and more likely to be obvious when the Moon is full. So the next time you are walking home at night or just sitting out under the night sky check it out. If there is a bright Moon up there at the time it is well worth a look. The fourth planet from the Sun, Mars is easily distinguishable by its sometimes intense reddish-orange hue which is stronger than any of the stars and the cause of its association with the Roman God of War. This redness is the result of the large amounts of iron oxide in the surface rocks and at times the sky appears pink from the fine particles of dust suspended in the atmosphere. Mars orbits the Sun once every 686.98 earth days in a markedly elliptical path that takes it from 210 million km to 250 million km from the Sun. If the Earth passes Mars when Mars is at its closest to the Sun, only 57 million km separate the pair and Mars will shine at a magnitude equal to that of the planet Jupiter. These close approaches occur at intervals of around 15 years and astronomers can sometimes take the opportunity to observe Mars at its best. Unfortunately it is at this point in its orbit when occasionally massive dust storms can engulf the whole planet spoiling the view. 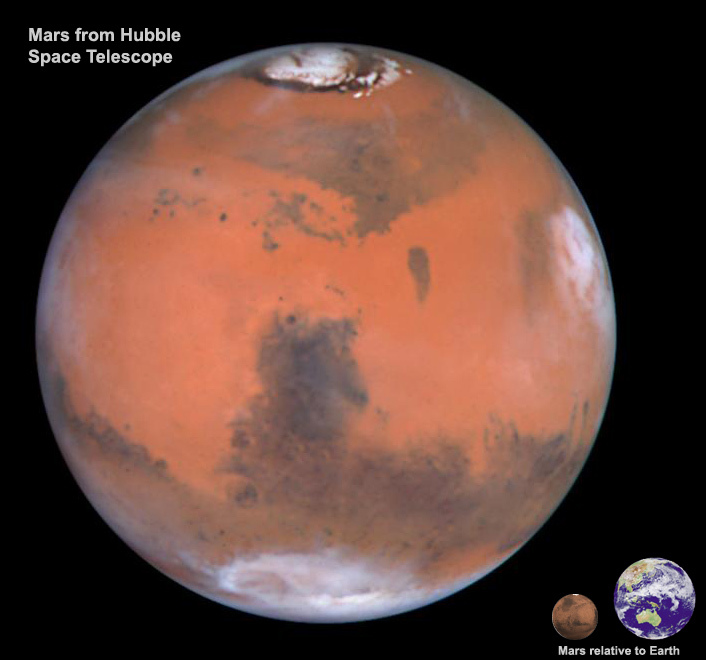 When Mars is its most distant from the Sun, nearly 100 million km separate it from the Earth and it can appear unimpressive even in large telescopes. Because it orbits outside the orbit of the Earth Mars can never appear as a crescent but at times can display a gibbous phase, like the Moon when it is a few days from full. The summer daytime temperature never rises much above 20 degrees C and can plummet to -140 degrees C just before sunrise each morning. Mars has a diameter of 6,795 km, just over half the Earth's diameter and rotates once on its axis every 24 hours 37 minutes and 23 seconds. This axis is tilted at 29.19 degrees to its orbital plane and these values help to make the Red Planet the most Earth like of all the other planets even though it has only 28 percent of the Earth's surface area. Although there is no liquid water at present, the presence of ancient water courses on its surface point to the existence of running water in the ancient past. White polar caps expand and contract with the changing of the Martian seasons and the ancient volcanoes would have gushed out enough gas to make the earlier atmosphere much heavier than the 7 millibars that it is today. This is 0.007 percent of the Earth's atmospheric pressure and consists mainly of carbon dioxide (95 percent), nitrogen and argon. Olympus Mons, 600 km wide and towering 26 km above the surrounding plain, is the largest known volcano in the Solar System. It dwarfs the largest volcano on Earth, Hawaii's Mauna Kea which rises a mere 9.3 km from its 120 km diameter base on the floor of the Pacific Ocean. Another dramatic feature is Mariner Valley, a massive rift 75 km wide, up to 7 km deep and extending 4000 km across the planet and making the North American Grand Canyon look like a small crack in the ground. Mars has two moons, Phobos and Deimos which are probably asteroids captured by Mars early in its evolution. They were both discovered in 1877 by astronomer Asaph Hall, the larger Phobos measuring 27 X 22 X 19 km and Deimos measuring 15 X 12 X 11 km. Phobos is remarkable in that it orbits Mars three times a day. It is the only known moon in the Solar System that orbits more quickly than its parent planet spins. It also lies closer than any other moon to its parent, a mere 6,000 km above the surface of Mars. This should make a spectacular sight for the first astronauts who might set foot on this fascinating neighbor of ours. There seems to be two main theories as to how the asteroids came into existence. The first suggests that they are the remnants of a planet destroyed in a massive collision long ago and the second, and it seems the most popular, is that they are left over rocky matter that failed to coalesce into a planet during the formation of the Solar System. Most known asteroids (about 95%) orbit in the asteroid belt, or main belt, between the orbit of Mars and Jupiter at distances of 1.7 to 4.0 astronomical units from the Sun. (One astronomical unit is equivalent to the distance from the Earth to the Sun or 149,597,870 kilometers). These main belt asteroids orbit the Sun in periods between 3 and 6 years. Like the planets, most asteroids follow direct orbits within 10 degrees of the plane of the ecliptic (The average plane of the Earth's orbit around the Sun) although in a more pronounced ellipses than the orbits of the planets. Other asteroids have very different orbits from these main belt objects and indeed some, the Atens group even cross the orbit of the Earth and are the subject of close scrutiny by some of the world's major observatories. Another group, the Trojans, orbits the Sun 60 degrees ahead and behind Jupiter in its orbit. 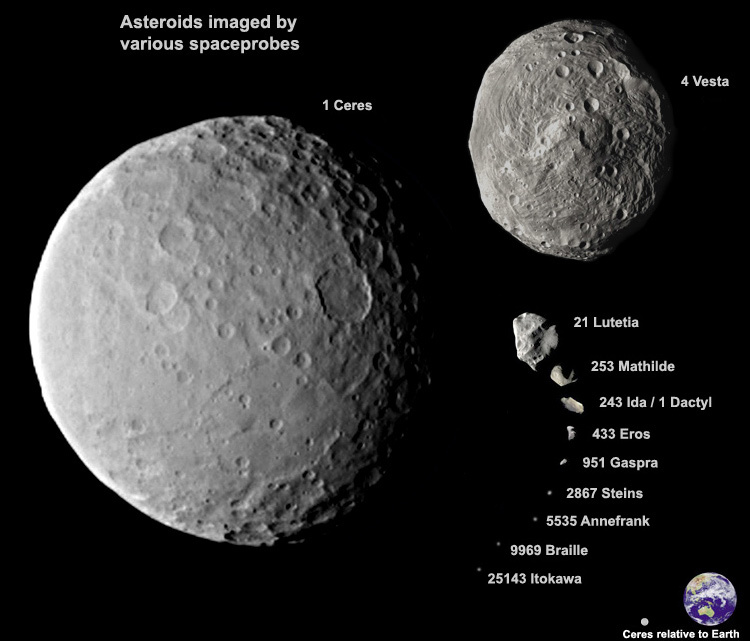 Asteroids vary in size from the largest, the 933 km diameter Ceres, to objects much less than 1km wide. Ceres however has now been taken from the list of asteroids and classified as a "dwarf planet" along with Pluto. It was discovered on the first day of January 1801 by Giuseppe Piazzi and at first was thought to be a comet. Asteroids shine by reflected sunlight and although there have been several hundred thousand discovered only one, Vesta, is sometimes bright enough to be seen with the naked eye. Even though it is not the largest of these objects it has a surface that reflects sunlight better than any of the others. Despite the great number of asteroids so far discovered their total mass is less that of the Earth's Moon. By far the largest of the Solar System planets, Jupiter is in fact 2.5 times more massive than all of the other Solar System planets combined. Named after the chief god in Roman mythology it is the undisputed senior member of the planetary family. A line of 11 Earths would be needed to equal Jupiter's equatorial width and it would take 1,318 Earths to fill its great volume. It has an equatorial diameter of 142,985 km and a polar diameter of 133,718 km giving it a distinctly flattened appearance. This oblateness is caused by its rather swift rotational period which is 9 hours 50 minutes and 30 seconds at the equator and 9 hours 55 minutes and 41 seconds at higher latitudes. This difference in rotation rate is possible because the planet is made up largely of gas. A small telescope brings into view some of the details of Jupiter's disk, dark belts of cloud parallel to the equator and an eye-shaped marking in the southern hemisphere known as the Great Red Spot which was first observed in 1665. This feature is an anticyclone 14,000 km wide and 40,000 km long, large enough to swallow three Earths. The spot however is not always red: most often it is pinkish and can sometimes fade to a light grey. The face of Jupiter never looks the same twice adding to the intrigue of this giant world. The key to Jupiter's weather is the fact that it gives off twice as much heat as it receives from the Sun. The planet was hot when it formed and still retains some of that heat today. This internal store of heat drives the complex cloud systems of the planet, keeping the Great Red Spot and its smaller relatives alive far longer than any storms on Earth with massive flashes of lightning being recorded on Jupiter's night side by the Voyager space craft. The winds in the upper atmosphere have been recorded at over 640 km/hour. Jupiter orbits the Sun every 11.86 years at an average distance of 778 million km, over five times the distance of the Earth from the Sun. Its average orbital speed is 13.06 km/second and since its rotation axis is only tilted 3 degrees in relation to the perpendicular of its orbital plane, it has almost no seasonal variation. It is accompanied in its journey around the Sun by at least 63 moons, most of which are small rocky bodies. 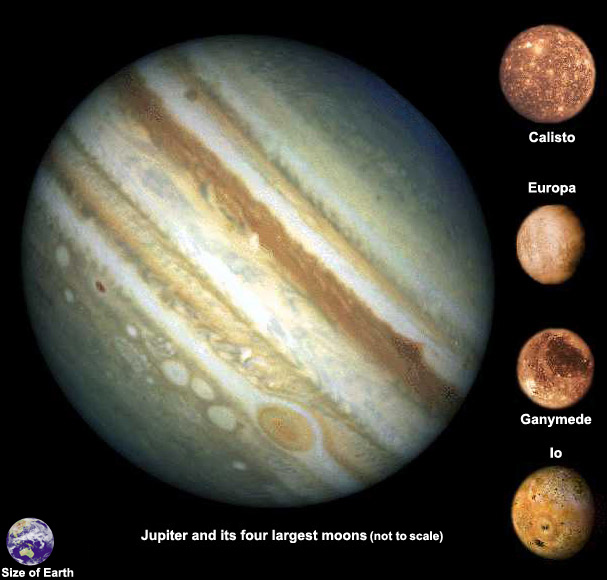 The larger moons, Io, Europa, Ganymede and Callisto are all bigger than the Earth's moon and are easily visible in even the smallest telescope. With a diameter of 5,262 km, Ganymede is the largest moon in the Solar System, even larger than the planet Mercury. These four moons were first seen by the astronomer Galileo Galilei in 1609 and are referred to as the Galilean Moons. The atmosphere of Jupiter is made up of hydrogen (86.4 percent) and helium (13.3 percent) with the other 0.3 percent a mixture of methane, ammonia, ethane, acetylene phosphine and carbon monoxide. Minute traces of water vapour have also been detected. At a depth of 1,000 km the hydrogen becomes liquid and at a depth of 25,000 to 30,000 km it becomes metallic. It is thought that a solid rocky core, twice the size of the Earth, lies at the centre of the planet. The ratio of hydrogen to helium in the atmosphere makes it almost identical to the Sun's atmosphere and if Jupiter were eighty times more massive it would have enough internal heat and pressure to start the nuclear fusion process occurring and it would become a star. The planet also has a magnetic field which is 19,000 times stronger than the Earth's magnetic field and in 1979 the space craft Voyager 1 detected a series of rings made up of small rocky material orbiting the planet. Jupiter is normally quite easy to spot when it is in the night sky as it outshines everything but the Moon, Venus and on rare occasions the planet Mars. It can be spotted even under light polluted city skies so the next time it is in your neighborhood make an effort to catch a glimpse of this king of the planets. The "JUPITER 2" program is a free download and will give you the positions of the Galilean moons for any date you set it for. The ringed planet orbits the Sun every 29.46 years at an average speed of 9.64 km/second and an average distance of 1,430 million km, 9.5 times farther than the Earth is from the Sun. With a equatorial diameter of 120,537 km it is second in size only to Jupiter and is the sixth planet from the Sun. Its polar diameter however is 10 percent smaller than its equatorial diameter and is the most oblate or flattened of all the planets; on Jupiter the difference is only 6 percent. The rotation rate at its equator is 10 hours 14 minutes and at higher latitudes, closer to the poles, is around 10 hours 40 minutes. Saturn is the least dense of all the planets and is the only one to have a density less than water, about 70 percent in fact. It is often stated that if a large enough cosmic ocean could be found, Saturn would float on it. Its rocky core is embedded in a layer of liquid metallic hydrogen 21,000 km deep over which lies a layer of molecularhydrogen. Saturn radiates 2.5 times more heat than it receives from the Sun, a legacy of its birth. The continuous release of interior heat is responsible for generating convection currents in the atmosphere and winds at Saturn's equator have been recorded at speeds of 1,800 km/hour. In 1990 the Hubble Space Telescope recorded an enormous storm that erupted near the planet's equator, an event which happens roughly every thirty years during summer in the planet's northern hemisphere. The atmosphere consists of 96.7 percent hydrogen, 3 percent helium and traces of methane, ammonia, ethane, acetylene and water vapor. Through a telescope, Saturn appears as a tranquil, ochre coloured disk, darker at the poles and with some horizontal bands. It is surrounded by a system of rings, orbiting in the plane of its equator, so intricate and dazzling that it is considered by many to be the most beautiful sight in the Solar System. The planet is tilted at an angle of almost 27 degrees to the plane of its orbit and at approximately 15 year intervals the rings are seen edge on as viewed from the Earth and seem to disappear momentarily. Galileo first saw the rings in 1610 but could not determine just what they were due to the primitive state of his equipment. It was left to Christian Huygens in 1659 to discover their real identity. As seen from the Earth, the rings look like a continuous solid disk encircling the planet but are in truth made up of many smaller ringlets, each containing millions of objects from tiny fragments of ice and dust to house sized boulders. The rings are 63,000 km in width but are thought to be less than 1 km thick. Material at the inner edge of the rings orbits the planet every 5.6 days while the material at the outer edge takes 14.2 days to complete the journey. To date there have been 60 moons discovered orbiting Saturn. The largest of these is Titan, the second largest of all the Solar System moons. With a diameter of 5,150 km it is only slightly smaller than Jupiter's largest moon Ganymede and larger than the planet Mercury. Titan is unique among moons in having a thick atmosphere mostly made up of nitrogen (90 percent) and methane making up the majority of the rest. Clouds of orange smog top the atmosphere which has a pressure on Titan's surface 50 percent greater than the Earth's atmosphere at sea level. The Earth and Titan are the only two Solar System bodies known to have liquid bodies on their surface as recent spectral observations have confirmed the presence of liquid hydrocarbon lakes on Titan. Without a doubt, Saturn is a most spectacular sight in any telescope of at least medium size. It is well worth the effort to catch a glimpse of this marvelous object which in the past has resulted in more than a few people rushing off to purchase a telescope of their own after a seeing Saturn in someone else's instrument. 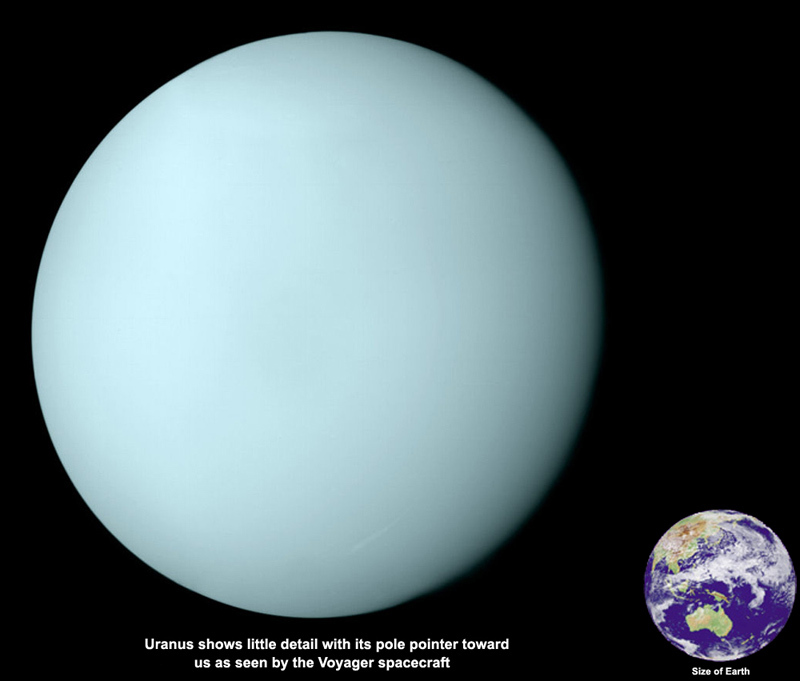 Uranus is an enigmatic blue-green world which has only recently begun to give up its secrets. It is the third largest of the gas giants and with a diameter of 15,128 km is four times the size of the Earth. The rotation rate of its axis has been determined at around 17.23 hours. It orbits the Sun every 84.1 years at a speed of 6.8km/second and at an average distance of 2.9 billion km. With its rotation axis orientated close to its orbital plane it, in effect orbits on its side turning in reverse to its orbital direction. This has very strange consequences as during its 84 year orbital period each pole spends 42 years in total darkness followed by 42 years in sunlight. This odd tilt of its polar axis is a bit of a mystery but is thought to have been caused by the impact of a large comet or asteroid sometime in the early part of its history. At its brightest Uranus should in theory be detectable to the naked eye but only appears as a faint star, so faint that it was never noticed by ancient astronomers for whom the Solar System stopped at Saturn. Discovered by William Herschel on March 13th 1781, it was the first of the planets to be discovered telescopically. In 1977 astronomers watched as Uranus passed in front of a star. Unexpectedly they noticed the star winked on and off a number of times both before and after being obscured by the disc of the planet. From this observation and others like it which followed astronomers deduced that Uranus was encircled by nine rings, so faint that they are not visible through a telescope from the Earth. Voyager 2 confirmed the discovery in 1986 finding eleven rings and also taking the number of discovered moons to twenty one. The planet is thought to have a rocky core consisting mainly of iron and silicon which is about the size of the Earth. This core is enveloped in a thick layer of liquid ice and rock but unlike Jupiter and Saturn it lacks a layer of metallic hydrogen. Its outer atmosphere is made up of 84 percent hydrogen, 14 percent helium and the other 2 percent contains methane, acetylene, hydrogen cyanide and carbon monoxide. Telescopically Uranus shows a featureless greenish disc which requires at least a medium sized telescope to observe. It is however worth the effort to locate and observe this distant world and wonder at the excitement that must have been felt by William Herschel when he first began to realize that he had discovered a new member of the Solar System. With the reclassification of Pluto as a dwarf planet, Neptune is now the outermost of the Solar System's planetary family and the smallest of the gas giants. It was named after the ancient Roman god of the sea, Poseidon to the ancient Greeks. With a diameter of 49,492 km it is large enough, if it were hollow, to hold thirty Earths. It orbits the Sun every 164.79 years at an average speed of 5.45 km/second and an average distance of 4,504,300,000 km. This is thirty times the distance the Earth is from the Sun and is the most circular of all the planetary orbits. Neptune's core is thought to rocky, primarily consisting of iron and silicon surrounded by an atmosphere of 84 percent hydrogen and 14 percent helium. The other 2 percent is methane with minute traces of carbon monoxide, hydrogen cyanide, acetylene and ethane. The planet radiates twice as much heat as it receives from the Sun resulting in wind speeds of up to 2,000 km/hour being recorded in its upper atmosphere, the strongest winds of any of the planets. Of Neptune's eight satellites, Triton is the largest and with a diameter of 2,700 km it is two thirds the size of the Earth's moon. It has a surface temperature of -240 degrees C and in places nitrogen gas shoots upward from vents for 8 km into the thin atmosphere of nitrogen vapor before drifting downwind to form dark plumes on the ground. Triton orbits Neptune in a retrograde manner, that is, in the opposite direction to the planet's rotation. This probably suggests that it is a body that originated somewhere else in the Solar System that has been captured by Neptune's gravity. Because of this retrograde orbit, Neptune's tidal forces are causing Triton to move slowly closer to the planet. In around 250 million years it will be close enough to be torn apart by these tidal forces and will add a new ring to Neptune's four existing rings, discovered by Voyager 2 in 1989. Unlike the accidental discovery of Uranus, the existence of Neptune was predicted in advance of its discovery. Observations showed that Uranus was not keeping to its predicted course and one likely reason was that it was being affected by the gravity of a yet unseen planet. In 1845 English mathematician John Couch Adams calculated the new planet's position and the following year a Frenchman, Urbain Le Verrier also came up with the same prediction. Neptune was found on September 23rd 1846 by astronomer Johann Gall and astronomy student Louis d'Arrest at the Berlin observatory using the calculations of Le Verrier. It was less than 1 degree from its predicted position. It is believed that Galileo may have observed Neptune in December 1612 and January 1613 but did not recognize it for what it was. His journals show that he observed an object very close to Jupiter on both these dates, recording that he noticed the movement of this object relative to a nearby star. It is entirely possible that he did indeed spot the elusive Neptune as modern astronomy computer programs set to these dates show the two planets in the constellation Virgo, superimposed upon each other. 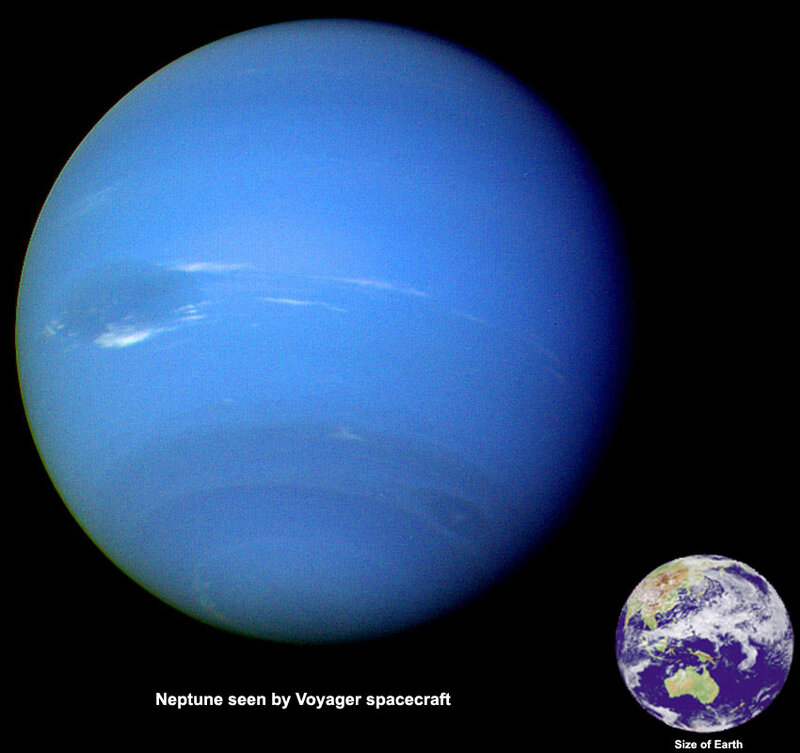 The Voyager 2 flyby of Neptune in August 1989 showed Neptune as a dynamic blue world with white cloud features and a dark blue spot called the Great Dark Spot, similar to the Great Red Spot on Jupiter. Images from the Hubble Space Telescope show that this dark spot has disappeared since then but others have formed in the meantime. In earthbound telescopes we see only a featureless blue disc floating eerily against the background sky and although it lacks the impact on the senses that the planets Jupiter and Saturn can provoke it is still worth the effort to locate this distant world. Like Neptune, the existence of Pluto was predicted by the wandering positions of Uranus and Neptune. Its discovery in 1930 by young astronomer Clyde Taumbah lauded the precision of the astronomical calculations. This later turned out to be incorrect, as Pluto is far too small a body to effect the orbits of the 2 gas giant planets. For the next 7 decades it was thought to be alone on the edge of the solar system. In 1995 Dan Brown discovered another similar body orbiting in the outer solar system. Since then many more similar objects have been discovered. So in 2000 the IAU International Astronomical Union decided to re-classify Pluto and all the larger of the new discoveries as Dwarf Planets. Public sentimentality protested against the demotion of 'poor old Pluto' but logic has prevailed and the IAU decision stands. This does not take anything away from Pluto at all. 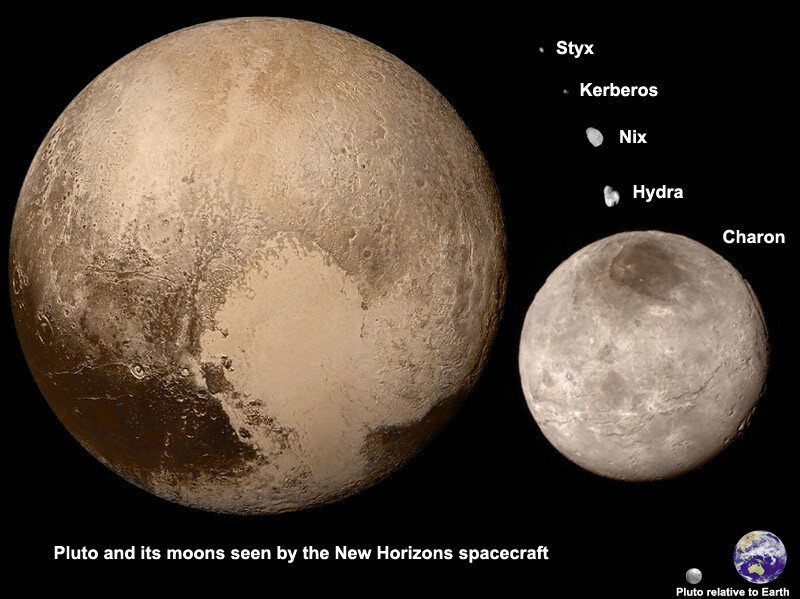 In 2015 the New Horizons spacecraft flew by Pluto after a 9.5 year journey and discovered that Pluto and its moon system are surprisingly varied little worlds. Astronomers continue to find sizable objects in the Kuiper Belt. 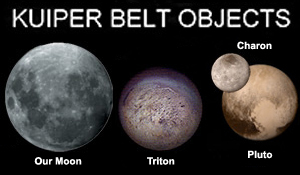 The illustration shows some of the largest bodies, including Neptune's captured moon Triton. The Earth's Moon has been included to give an indication of relative sizes. 134340 Pluto *, Diam 2,320 klms, Period 248.5 years, Mean Dist to Sun 29.7 to 49.3 AU, Mag 13.6, 5 moons. 136199 Eris, Diam 2,300 klms **, Period 557 years, Mean Dist to Sun 37.8 to 97.6 AU, Mag 18.8, 1 moon. 90377 Sedna, Diam 1,600 klms, Period 10 - 12 thousand years, Mean Dist to Sun 76.1 to 975.5 AU, Mag 20.4. 136472 Makemake, Diam 1,500 klms, Period 310 years, Mean Dist to Sun 38.5 to 53.1 AU, Mag 16.7, 1 moon. 136108 Haumea, Diam 1,436 klms, Period 283 years, Mean Dist to Sun 34.7 to 51.5 AU, Mag 17.3, 2 moons. 50000 Quaoar, Diam 1,250 klms, Period 288 years, Mean Dist to Sun 41.9 to 45.2 AU, Mag 18.5, 1 moon. 1 Ceres, 950 klms, 4.6 years, Mean Dist to Sun 2.7 AU, Mag 6.9. 90482 Orcus, Diam 950 klms, Period 245 years, Mean Dist to Sun 30.3 to 48 AU, Mag 19.1 1 moon. 20000 Varuna, Diam 800 klms, Period 283 years, Mean Dist to Sun 40.9 to 45.3 AU, Mag 19.9. An interesting Fact... there are 7 moons in the Solar System, including our Moon, that are larger than Pluto. 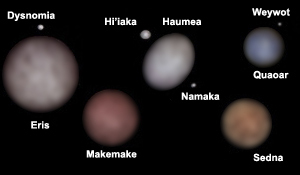 * From 2009, larger dwarf planets such as Pluto, Eris, Haumea and Makemake are classed as "Plutoids". ** November 2010, a stellar occultation event indicated that Eris is now just slightly smaller than Pluto. Perhaps the most mysterious and awe inspiring of all sky spectacles are the comets that reach naked eye visibility. These visitors from the outer reaches of the solar system have been observed since antiquity and were quite often looked upon as omens that foretold of impending disaster. The comets that return within periods of less than two hundred years are thought to come from the Kuiper belt, a region of space just past the orbit of Pluto. The most famous of these is Halley's Comet which returns to the inner solar system every 76 years and is due again in the year 2062. The first recorded sighting of this comet was in 240 B.C. which gives astronomers observational data for 30 apparitions. The longer period comets come from a more distant region of space called the Oort cloud which lies at a distance of around 100,000 astronomical units from the Sun. (An astronomical unit is the distance from the Earth to the Sun, 149,597,870 kilometers). Comets are often referred to as dirty snowballs and are comprised mainly of dust and frozen gasses circling the Sun in highly elliptical orbits. As they approach the Sun they begin to sublimate, the outer part of the nucleus of the comet turning directly from a solid to a gas. The gas and dust is forced away from the head of the comet by radiation pressure and by the solar wind which usually results in two types of tails being formed, the ion tail and the dust tail. The ion tail, consisting of ionized molecules, points directly away from the Sun and is typically blue in colour. The dust tail contains solid particles which reflect sunlight and is more curved than the ion tail and lies back more in the direction of the comets orbit. These tails can be millions of kilometers long and are what makes some comets such a great spectacle. 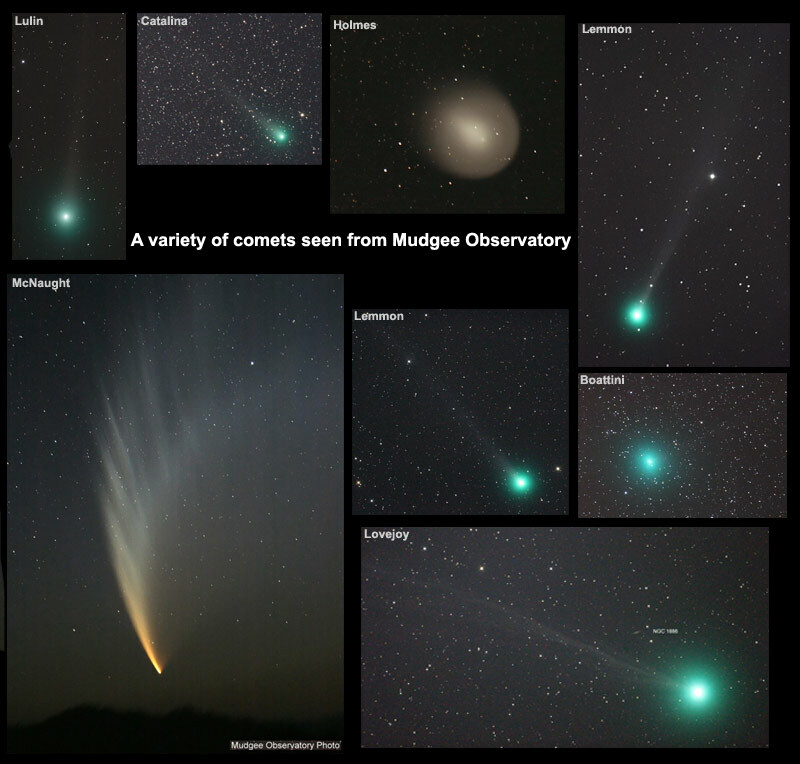 Comets that barely reach naked eye visibility are a reasonably rare and occur on average about every three or four years whereas bright comets with spectacular long tails are observed roughly every ten years or so. Scientist now have the technology to land a spacecraft on the nucleus of a comet and the Rosetta space mission will do so in the near future helping to unlock some of the mysteries of these curious objects.